Tell us a little about yourself. Angel Lebak is a proud wife, mom, business owner and ministry leader. Angel is passionate to help people navigate the waters of life, ministry and business with freedom and laughter. 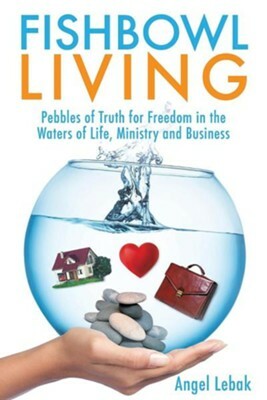 Learn what pebbles Angel used to help swim through the struggles and triumphs in ministry, business and life experiences. Angel is happily married for over 20 years, has 2 teenage children, is the owner of Assistant Angel, LLC and Virtual Assistant Training Network. What was your motivation behind this project? I noticed that the same "pebbles of truth" we used in ministry and our marriage, were also applicable to business. What do you hope folks will gain from this project? I pray that anyone who has a heart for ministry whether in business or outside of business, knows the freedom and deep cleansing of these pebbles of truth. If we can work on these pebbles, it helps filter out the other areas of distraction in our lives. How were you personally impacted by working on this project? I have been in ministry for 20+ years, married for 22+ years and owned a business for 6+ years. This has been the most challenging in terms of ministry and deep truths. I learned a lot about myself, my struggles, and what I wish I had learned earlier in life, ministry and business. Who are your influences, sources of inspiration or favorite authors / artists? I enjoy business books by Seth Godin, Dave Ramsey, etc. For pleasure I am a huge Lori Wick, Beth Moore and Karen Kingsbury fan. Anything else you'd like readers / listeners to know: Don't be overwhelmed by these pebbles. Take one pebble at a time. This is a process of deep cleansing. I am continually being challenged in these areas and know that ultimately there will be growth and maturity because of these powerful truths.